Référence bibliographique : Luke Sunderland, Rebel Barons: Resisting Royal Power in Medieval Culture, Oxford University Press, 2017. Ambivalence towards kings, and other sovereign powers, is deep-seated in medieval culture: sovereigns might provide justice, but were always potential tyrants, who usurped power and 'stole' through taxation. Rebel Barons writes the history of this ambivalence, which was especially acute in England, France, and Italy in the twelfth to fifteenth centuries, when the modern ideology of sovereignty, arguing for monopolies on justice and the legitimate use of violence, was developed. Sovereign powers asserted themselves militarily and economically provoking complex phenomena of resistance by aristocrats. This volume argues that the chansons de geste, the key genre for disseminating models of violent noble opposition to sovereigns, offer a powerful way of understanding acts of resistance. Traditionally seen as France's epic literary monuments - the Chanson de Roland is often presented as foundational of French literature - chansons de geste in fact come from areas antagonistic to France, such as Burgundy, England, Flanders, Occitania, and Italy, where they were reworked repeatedly from the twelfth century to the fifteenth and recast into prose and chronicle forms. Rebel baron narratives were the principal vehicle for aristocratic concerns about tyranny, for models of violent opposition to sovereigns and for fantasies of escape from the Carolingian world via crusade and Oriental adventures. 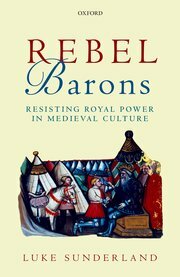 Rebel Barons reads this corpus across its full range of historical and geographical relevance, and through changes in form, as well as placing it in dialogue with medieval political theory, to bring out the contributions of literary texts to political debates. Revealing the widespread and long-lived importance of these anti-royalist works supporting regional aristocratic rights to feud and revolt, Rebel Barons reshapes our knowledge of reactions to changing political realities at a crux period in European history.